Post 106: KOA Alamogordo / White Sands NM - A Snails Life and Lovin' it! After we left Aguirre Springs Campground, we were struggling to find a new place to camp in. 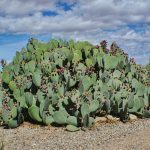 We drove blindly for a bit, only wanting to head south until… we arrived at ALAMOGORDO! There were many campgrounds in this city, but few had any reviews and some had unfavorable reviews. We wanted to go to a place with full hook ups so we could recharge our batteries and clear out our tanks. 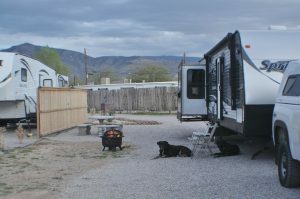 Our decision to go to KOA Alamogordo / White Sands NM was the perfect decision! Up to now, we have not been very impressed with KOA comp grounds, but THIS KOA impressed us from the time we pulled into the parking lot. The place was very clean, the sites were large and the office was really attractive with landscaping all around the outside, and the STAFF were incredible! Bill went into inquire if they had any vacancies. A short time later he came out with a smile and said “They are super nice people in there. The gift shop is really cute. The price was only $39.00 with full hook ups. The next surprise was the site! 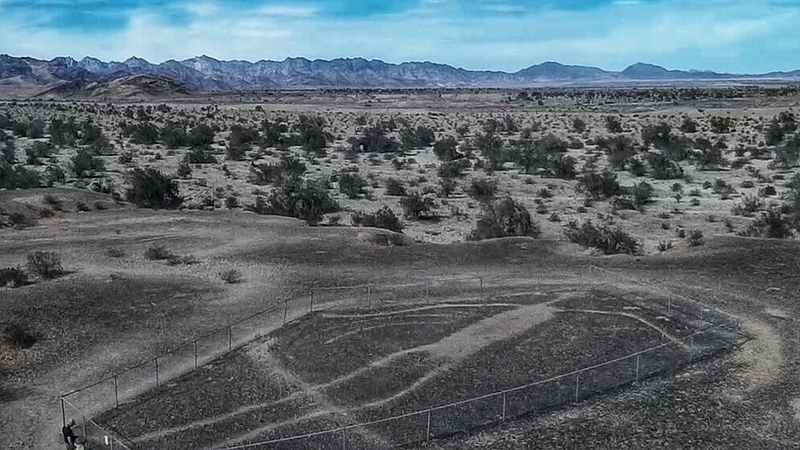 The site was 60 ft deep and 30 ft wide. With a cement picnic table and a charcoal grill. We also had a cement brick dividing wall. To finish off this decent site, there was a medium size shade tree and a metal 4 ft shaded lamp that we could turn on ourselves at night. The pull thru was gravel with a cement sidewalk right where our stairs came out from our trailer. This we assumed was the basic site. But we were very pleased and pleasantly surprised. We then found out our internet was “Lite” which was perfect for us to do our work on. The camp ground also offered free internet that Bill found quite decent. WATER PRESSURE (90 PSI!) ooohhh wow the water pressure was incredible. Once we turned on the utilities and found the water pressure, we both wanted to have a NORMAL shower lol. What a treat. Typical office, until you walk inside! This KOA had so much to offer, you will see on the attached link, but to name a few, they had many sites to accommodate any size rig. There was a beautiful outdoor pool, 50, 30 and 20 amp services. They had 2 Camping Cabins, tent sites, a dumping station and Men’s and Ladies restrooms. A laundromat, store, Rec room, a ping pong table, coffee nook, dumpsters, playground, horseshoes and for that final perk, THEY SOLD PROPANE. The park was well thought out, landscaped and well cared for. They even had a decent sized doggy park. This KOA put a new light on KOA’s for us. Even though it was situated in the city, we didn’t feel like we were in the city. BUT we were within walking distance to many stores so we didn’t have to unhook our truck if we didn’t want to. We liked this place so much, we decided to stay an extra night. We wanted to catch up on our blogs and this seemed the perfect place to do this. Bill went into the office to make the arrangements. Unfortunately our particular site was reserved for that night, but they had another one available for us that was “Enhanced” for $5.00 more. The KOA had only opened up this section this year. Bill agreed and paid the extra $5.00 and we moved over to the new site. WOW…we moved from site 30 as I described above to site E2… the Enhanced site. Spacious sites, especially the enhanced sites! Joy believes this is like the site that we moved to :). The $5.00 sure seemed worth it lol. That was not our rig haha. Wouldn’t mind having it though grinz. 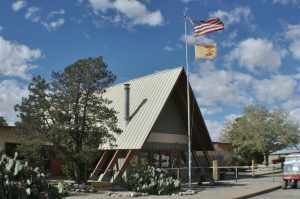 All said, we would certainly recommend this KOA Alamogordo / White Sands NM ANYTIME!!! We actually bypassed White Sands. We just vegged out at the KOA. Needed a bit of quiet time. We are now just west (30 miles) of San Antoino Texas. We actually thought of stopping by to say high, but we made reservations in New Orleans for later this week so we are trying to move a few hours each day. Hope all is well and the job is going well. No worries, knowing you’re making your way back home for the summer months. New Olreans, huh…you’ll need to let me know whatcha think after you’ve been there. Haven’t been myself but I’m sure it will be on the list one of these travel times. Take good care…really happy hearing from you! OH, job is going well…we have decided to stay till after the ABLQ. Balloon Fest…that’s Oct 6th – 14th to help out here at the park…I guess it’s a zoo with travelers trying to find room to attend.